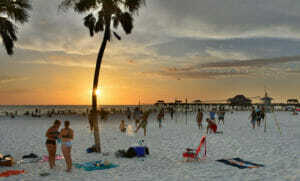 Heading out for a day of fun in the sun with family or friends at the beach? 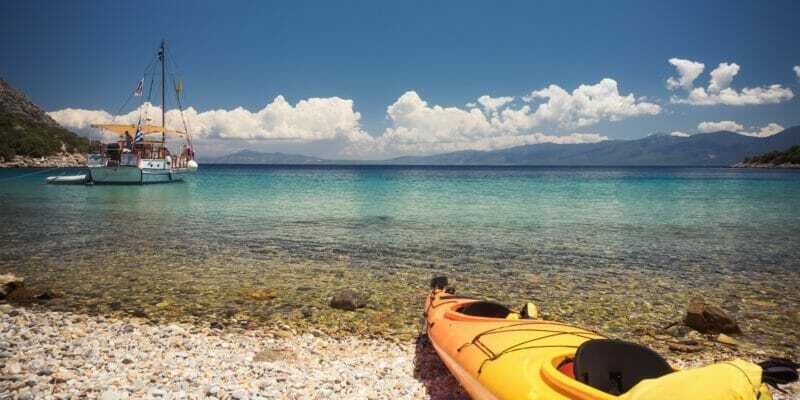 Everyone loves the fresh ocean air and feeling of warm sand between their toes, but dealing with all the chairs, tents, coolers, umbrellas, toys and towels can be a huge headache. Making multiple trips, especially with young kids in tow, to haul all your gear can really put a damper on your outdoor outing. Having the right beach cart or wagon solves this problem, and makes getting your gear from the vehicle to the beach a breeze. In this post, I’ll review the best beach carts and wagons for sand, mud, and anything else you come across. 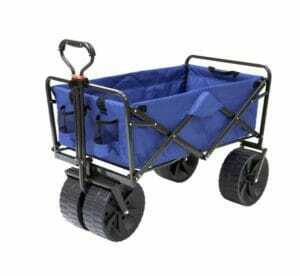 These roomy beach carts and wagons are great for transporting lots of gear over soft sand, mud or gravel. Most have oversized wheels which make towing them through soft ground an easy task. They are not just for the beach either! 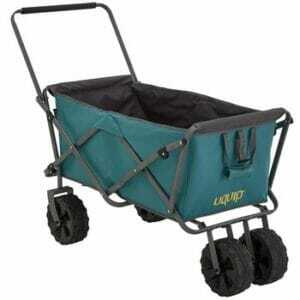 These versatile carts are great for camping, gardening, sporting events, and concerts too. Below are the best beach carts and beach wagons for sand available on the market today. Any one of these is a great choice for carrying all your gear to the beach. What to look for when buying a beach cart or wagon? This high quality, heavy duty cart is the perfect pick for a day at the beach. The Mac Sports Heavy Duty Collapsible Folding Wagon Cart has a weight capacity of 150 lbs, so you will have no problem fitting all your gear inside. Manufactured by MAC Sport, who have been making quality recreational and sporting equipment since 1993, this is a product you can trust. The interior of the cart measures a spacious 36.2″ x 21.4″ x 24”. That’s big enough to fit a ton of gear, no need to worry about it being too small. The frame is manufactured of durable metal and can withstand regular wear and tear. The wide, oversized wheels perform well on soft sand and do not sink into the sand like some carts with narrower wheels. When folded up, the cart measures 31.5” x 21.4” x 9.7”. At less than 10” thick, it’s easy to fold up and store in the back of any car. The telescoping handle is also adjustable which allows you to set the handle height to your preference. There are also two mesh cup holders on either side of the handle, so you can stash a few cold drinks for the trek to the beach! The Rio Brands Deluxe Wonder Wheeler Wide stroller style beach cart is the classic beach cart design. It’s a perfect choice for families who need lots of storage space and won’t break the bank! With large, wide rear wheels and small articulating front wheels, this beach cart is designed to be pulled rather than pushed along the sand. When on pavement or another hard surface, you can either push or pull it. It has a spacious storage capacity of 15 cubic feet and a weight capacity of 100 lbs. The X shaped metal frame is designed to hang up to four full-sized beach chairs. The 4 inch wide wheels on this model have been redesigned to create a larger footprint in the sand, which distributes the weight over more area and allows you to pull the cart through the sand easily. Some other cool features Rio has added to this model are a side umbrella holder and a detachable mesh tote bag. The tote is a decent size, and easily holds plenty of snacks, drinks and more. This cart is a beast! The unique design of the Challenger Mobility Folding Beach Cart makes it one of the best choices for deep and soft sand. The frame is sturdy tubular steel with an epoxy powder coat. The oversized inflatable wheels are 7 inches wide, which enables the cart to glide effortlessly over sand, mud, gravel and most other terrains. You will have no problem with wheels stuck in the sand here. The detachable wheels are inflatable and can be easily inflated with the included hand pump or an electric pump. When you finish using the cart, it folds up and will fit comfortably into a car trunk. The handle is also adjustable, from 29” to 49”, so it’s suitable for pretty much anyone. Most importantly, this cart can handle a ton of gear. With a weight capacity of 165lbs, and the bottom platform measuring a roomy 14” wide and 14.5” deep, you can load this cart up with all your beach stuff and have room to spare. There is a strap included for cinching things to the frame, ensuring everything stays in one place while you comfortably wheel down to the waterside. If you’re looking for one of the best beach carts for soft sand, then this is the one! If maximum towing capacity is what you’re after, then the Uquip Outdoor Cart Buddy XL is the cart for you. With a weight capacity of 220 lbs, this heavy duty collapsible cart is the heavyweight champ of beach wagons. It has a similar design to the MAC but with greater dimensions and weight capacity. Like the MAC, it can be quickly folded up into a compact profile which is easy to store away. The collapsible steel frame is durable and able to support a good deal of weight. The handle differs slightly from the MAC’s, being one wide piece that runs the width of the cart. This is a nice design as it allows two people to pull the cart simultaneously if need be. The large wheels are extra wide at 8”, which makes pushing or pulling this card through sand a cinch. The handle also articulates forward so you can adjust the height of the handle as you move it. If you have a lot of gear to move, you’d be hard pressed to find a better beach cart. While not strictly made for the beach, the Tipke 2100 Marine Fold-It Utility Cart all-purpose utility cart is a great choice for anyone looking for a cart that can handle a variety of tasks well. With a whopping 330 lbs. 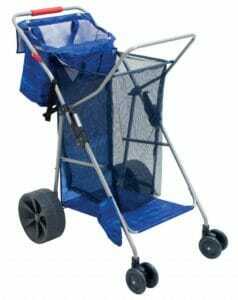 weight capacity, this cart can easily handle any beach related activity you can throw at it. 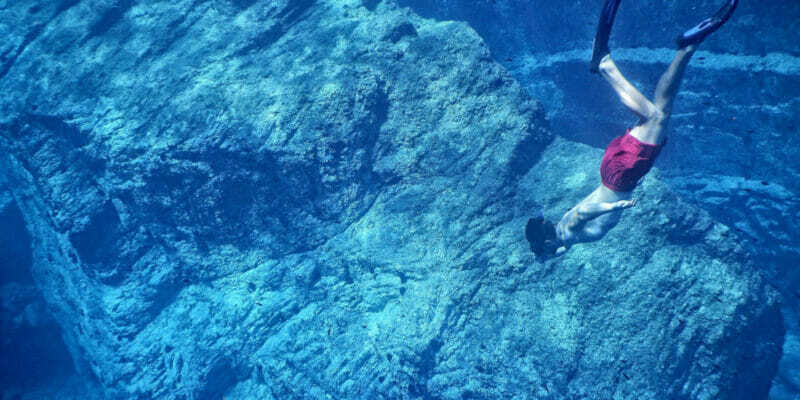 The cart is manufactured of marine-grade aluminum, which is specifically designed to withstand salt water without rust or corrosion. This also gives it far more durability than canvas beach carts. It folds up nicely into less than 2 square feet of space and will fit in a car trunk easily. Unlike most typical beach carts this cart has only one set of wheels. 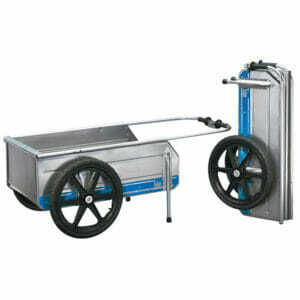 Tipke designed the cart to distribute the load over the wheels which gives it great maneuverability. The handle is fully retractable and folds away into the sides of the cart when collapsed. The wheels are slightly narrower than beach carts made specifically for the sand. It can handle regular sand, but if you plan to use it on particularly soft sand look for a cart with wider wheels. That said, this cart is truly a great multi-use item. It works great for gardening, camping, and is great as a bike trailer with a hitch as well. The beach enthusiasts over at Tommy Bahama have put all their years of experience to work and built one awesome beach cart. 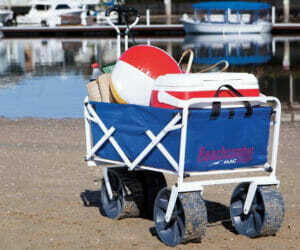 The Tommy Bahama All Terrain Beach Cart upright style cart is perfect for a day out with the family by the waterfront. It has a weight capacity of 100 lbs and 15 cubic feet worth of storage, while also holding up to four full-sized beach chairs. Weighing in at just 13 lbs. this cart is a great lightweight option. The wide rear wheels help the cart roll smoothly over sand, while the small front wheels make turning the cart easy. Durable mesh fabric lines the compartment, which dries off quickly should you get it wet. 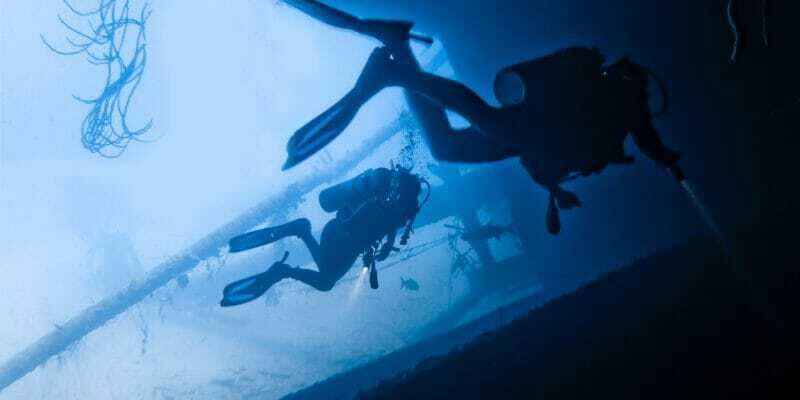 The frame is made of powder-coated steel, protecting it from saltwater damage. 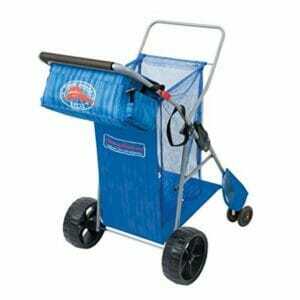 This cart also includes a removable, water-resistant, insulated cooler tote bag. This is a really nice touch, as you can always use an extra cooler at the beach. The cooler is a good size and can easily hold 8-10 regular sized cans with room for ice. An umbrella holder is included along the side of the cart. This stylish cart is truly one of the best beach carts for the sand. There’s a lot to consider when deciding on the right beach cart or wagon for your needs. They vary considerably in quality, price and ideal use case. Below are a few factors to keep in mind when selecting one of the best beach carts for sand. Portability. Most people will need a cart that folds up and will fit comfortably in the back of a vehicle. All the models reviewed here fold up to a compact size. Make sure you check the dimensions of the cart or wagon when it is collapsed to see if the size is right for you. Some models are also much lighter than others. Most people find a lighter cart easier to use so if you’re going to be carrying less stuff opt for a lighter cart. Durability. We all expect our gear to last a long time and withstand regular wear and tear. Beach carts are no exception. 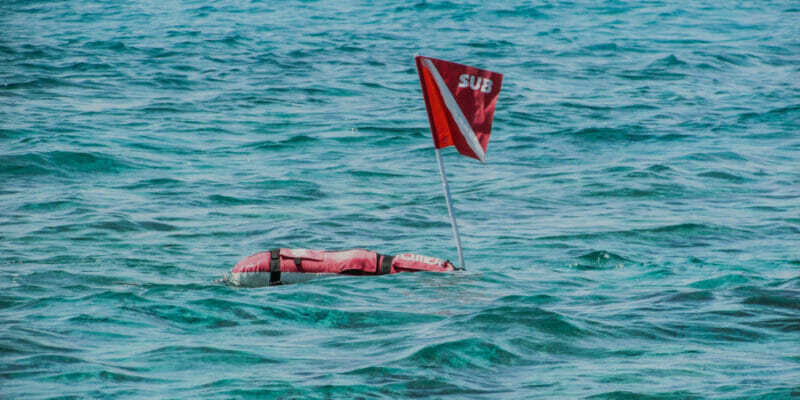 Look for a cart with a metal frame and some sort of waterproof or rust-resistant coating to ensure it will hold up to the salt water environment. If you plan on using your cart a lot, it may be worth spending a little more and getting a cart that can take more punishment. Terrain. It’s important to consider what type of terrain you will be using the cart or wagon on primarily. 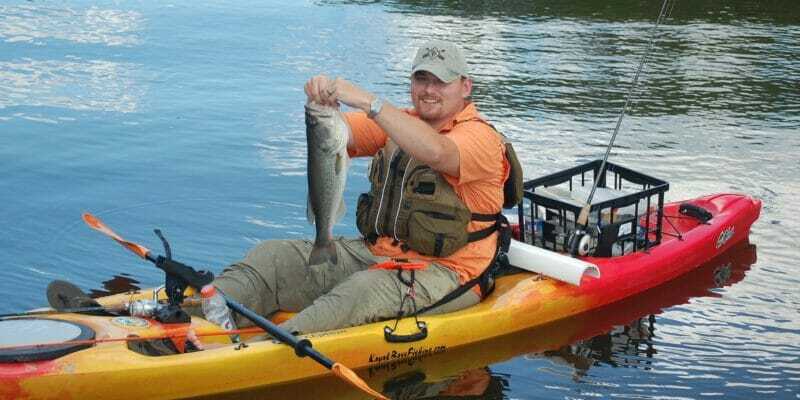 If you plan on using it on super soft sand, then opt for a cart with inflatable tires. These carts are the best beach carts for very fine sand. If you will be using it on typical beach sand, then carts with hard wheels will work just as well. Many beach carts are also useful for other environments besides the beach. Particularly, the wagon style carts with a low center of gravity. They can be useful for gardening, going to the park, outdoor events, and camping. Price. Of course, price is always an important factor when making your decision. Buying the cheapest model available is not the way to go when it comes to selecting a beach cart. You often end up with a vastly inferior product. 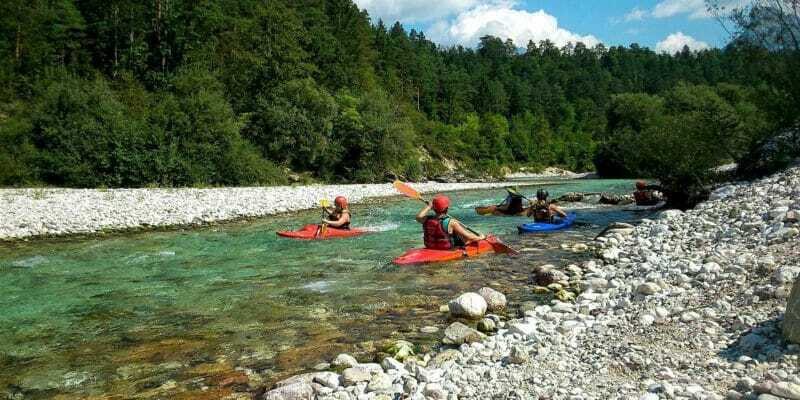 Look for companies with years of experience designing and manufacturing sporting goods, they know how to make a quality product that will last. Storage capacity. Pay attention to the weight capacity and storage area of the cart. Most beach carts will hold between 100 – 250 lbs. If you’re the type of person that tends to bring a lot of gear with them to the beach, look for a cart with a higher weight capacity. The wagon style carts tend to hold more weight than the upright stroller style carts. It’s interesting that you can get wagons that are good at being in sand. It makes sense that you would want to bring them to the beach. That way you don’t have to worry about getting your things stuck.